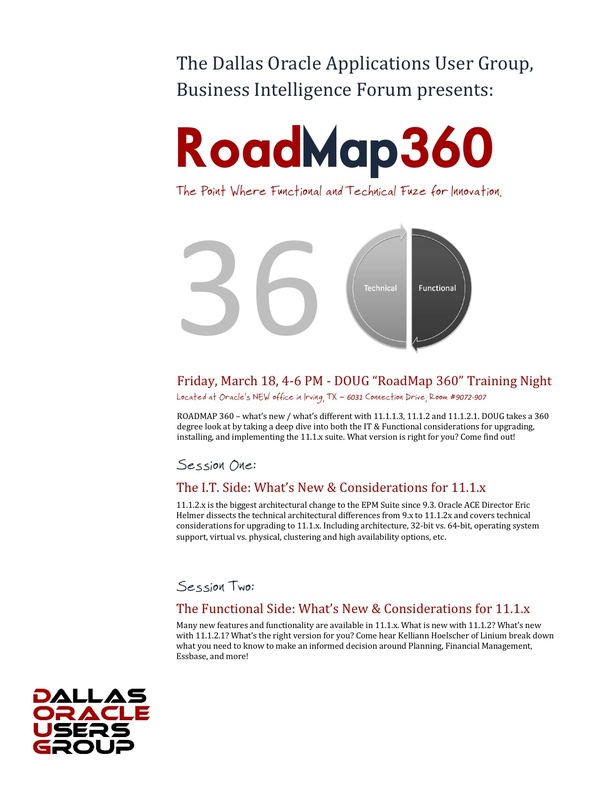 Eric is Speaking at Roadmap 360 training day in Dallas March 18th. As the new co-chair for the Dallas Oracle Applications User Group, Business Intelligence Forum, I will be actively involved in setting up, coordinating, and planning the new direction of the DOUG BI Forum meetings. The vision is a radical change from a monthly meeting format to a quarterly training day format. We will be chancing the focus to giving our members what they want – good technical content that can help them day to day, while minimizing marketing fluff. Each Quarterly training day will have a particular theme of that should be of interest to anyone involved in EPM/BI and would like to learn new important skills. To get started, we will be opening the first quarterly meeting this year with “Road map 360”. The theme is around what is new and what to expect in EPM 11.1.2 and 11.1.2.1. the “360” components means that we are attacking it from both an IT/architectural AND and functional perceptive. As I have posted before, version 11.1.2 is the biggest Architectural change I have seen with this product and there are many considerations when considering going to that version. Therefore, I will be speaking on the I.T. Side of the road map. For the functional side, Kelliann Hoelscher will be talking about new features and functionality that you will want to consider in the 11.1.2.x suite. Come by March 18th from 4-6 pm at the NEW Oracle Building in Las Colinas, Tx. Come meet the new DOUG BI Forum leadership, and get a feel for it’s new direction and focus. We welcome any input to make this the best regional Oracle user group experience in the nation. Plus… there will be refreshments, and that’s not too shabby. Address: 6031 Connection Drive, Las Colinas, Tx. Room #9072-­‐907. Open and free to anyone. ~ by Eric Helmer on February 22, 2011.